I remember very clearly when the idea for writing a novel set in the Shanghai of the 1920s and 1930s came to me. I was out strolling the city one evening. It was around dusk in October, one of the best times of the year in Shanghai. Perfect walking weather. I reached the crossroads at Jiangxi Middle Road and Fuzhou Road, just opposite the Metropole Hotel. For a moment, there was no traffic and no people, a strange occurrence in the city. I was suddenly transported back to the 1920s, imagining old Dodges, Packards and Chevrolets rolling up to the hotel, discharging carloads of flappers and elegant men wearing tuxedos. A lovely moment, trapped in time. The period between the wars was an amazing time in Shanghai. The city of ‘joy, gin and jazz’ was an amazing melting pot of adventurers, spies, triad members, opium smugglers, merchants, con-men, communists, criminals, fascists, Japanese militarists, gamblers and refugees. With such a witches’ cauldron of deceit and double-dealing, happiness and despair, wealth and poverty, it soon became obvious that only a crime novel, with its strong moral compass, could explore the depths of the abyss that was Shanghai. And so the books were born. The two main characters, Detective Inspector Danilov and Detective Sergeant Strachan, are both outsiders, in a society full of outsiders. They are employed by the Shanghai Municipal Police but distanced from the rest of their colleagues, and from the society of the time. Mavericks are always so much more interesting to read about and to write. The choice of Danilov as the lead in the books actually came from a line in a policeman’s memoir of the time. He mentioned that when they had a problem, both the French and Shanghai police turned to White Russian members of their forces to solve it for them. 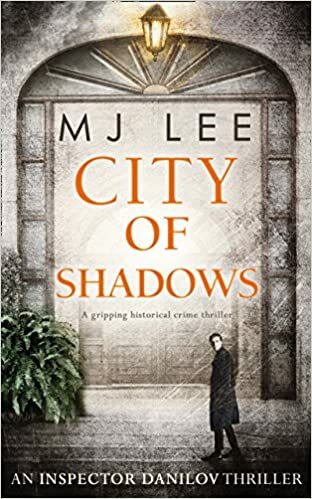 Two books in the series have been published so far, Death in Shanghai and City of Shadows, with a third on the way in October this year. Given the wonderful cesspit of characters who lived in Shanghai, the original ‘Pearl of the Orient’ there’s no shortage of wonderful material for the future. Details: The Danilov series is published by Carina, an imprint of Harper Collins, in eBook, priced in local currencies. This post submitted by Siobahn Daiko.